of the altar of the Sister Disciple’s Chapel. 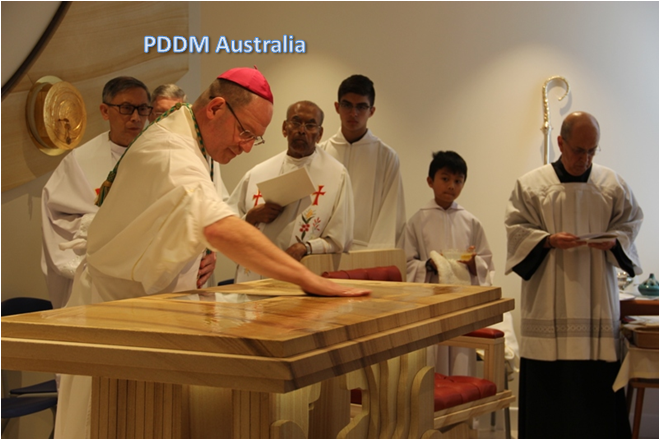 PDDM Australia:On the 15th September the Sister Disciples of the Divine Master of the Strathfield community had the joy of welcoming to the blessing ceremony of our renovated chapel, our General Councillor, Sr. Giovanna Uchino, who came from Rome, our sisters from other communities in Australia, members of the Pauline Family and many of our family and friends. As our lives and charism is centred on the Eucharist and the Liturgy, the renovation of the chapel was a project that was very dear to our hearts. We spent many months praying, planning and consulting with experts in order to create a beautiful sacred space that would be a truly worthy dwelling place for the Eucharistic Lord and also a place that would be conducive to prayer and reflection. Indeed the aim of the Sister Disciple’s mission is to draw many people to the Eucharist where they will receive light, strength, grace and blessings for their own spiritual journey and that of their loved ones. We already have the joy of welcoming many people who come to join us in our daily Mass and Eucharistic Adoration. We also receive many prayer request by phone or in digital form. We hold up to Jesus all these intentions and pray for the needs of the Church and all of humanity. We were able to realize this project with the help and generous support of many wonderful people. We were also blessed to have a very expert team of architects, builders, designers, tradesmen and technicians who all worked with great skill, commitment and care. Our own architect, Sr. Mariella contributed by designing the artistic feature on the back wall of the Sanctuary and also by drawing up plans for the ceiling of the chapel. We were delighted and honoured to have Bishop Anthony Randazzo preside at the Eucharistic Celebration and the blessing of the chapel. Fr Michael, Fr. Nestor and Fr Andrew of the Society of St Paul together with Fr Peter Joseph, parish priest of St Dominic’s in Flemington, concelebrated. The assistance of the master of ceremonies and two altar boys was greatly appreciated. The special Liturgical celebration was also enhanced with beautiful instrumental music and singing. The festivities continued after Mass where everyone enjoyed each other’s company and the light refreshments. Everyone found the celebration to be a spiritually enriching and uplifting experience.